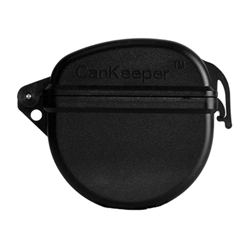 The CanKeeper is a water and airtight container for smokeless tobacco- snuff- designed for Solider who needed a means to keep their "dip" dry and hidden. Super strong resin construction with an O-ring seal makes it a perfect container for a wide range of uses. Smokeless tobacco tins are firmly held by special alignment rails molded into the inside of the case, and a patented cutting tip allows for easy opening of tins. Made from a space-age composite that you can literally drive a truck over. Locking latch holds lid securely closed and has a steel pin hinge for long use. O-ring seal in the lid guarantees protection against the elements. 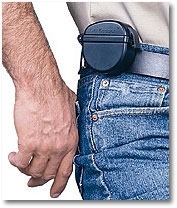 A belt clip firmly .holds the case at your side, and a lanyard hole is molded in for added security. Measures approximately 3"/7.6 cm x 1-1/4"/3.2. Hundreds of other uses, including: • Holds 2 rolls of 35mm film • Keeps matches dry • Holds fishing accessories • Holds gum and candy • Protects keys, money, watches and more. Black only!